PTF is a leading provider of Temporary Mesh Fencing, Temporary Pool Fencing, Hoarding and Crowd Control Barriers . 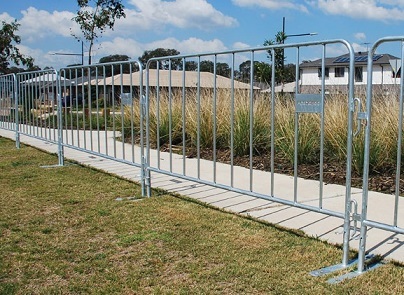 Perth Temporary Fencing crowd control barriers are one of the only barricades on the market that feature dual interlocking hinge points, making them one of the sturdiest and ideal choice of crowd control barrier. Our fast mounting, interlocking system makes installation a breeze, and our panels also offer removable feet, making it extremely easy to stack and store panels. Low-intrusion flat feet prevent trip hazards, come with pre-drilled holes for bolt-down installations and will ensure you meet OH&S requirements, whilst providing maximum safety to workers and pedestrians. This makes our barriers extremely popular for event organisers looking to hire crowd control barriers in Perth, with dozens of events utilising Perth Temporary Fencing’s crowd control solutions every year. We specialise in providing effective solutions for overcoming security challenges encountered by event managements. If you are planning to manage a public event and are concerned about controlling or restricting the pedestrian traffic, crowd control barriers are the right choice. Get in touch with the team at Perth Temporary Fencing for an in-depth discussion about the size of your event and control measures required, and we’ll help you find a suitable crowd control barrier solution today. Our products are designed to the Australian Standard and are hot-dipped galvanised. These fences come with flat removable feet that reduce the tripping hazard during transportation. Their exquisite design helps these fences seamlessly fit any surrounding as well as complement it. PTF embarks on supplying sturdy and stylish crowd control fences that provide an efficient barrier for blocking and diverting traffic. Moreover, these fences are ideal to support the specific needs of any event and are easy to transport, assemble and dissemble. Be it a one-night show or an event that lasts over a week or more, our crowd control barriers are designed to suit events of all kinds across the wider Perth region. Our competitive pricing and prompt responses make us an outstanding solution for temporary fence hire needs. In addition to this, our crowd control fences are designed to Australian Standard AS 4687-2007 and are the safest option when it comes to fencing. We can help you in directing the crowd with effective portable railings and diverting crowds from entering the dangerous, restricted or no-access zones. Our crowd barriers are designed to withstand the test of time and the wear and tear of large gatherings. These fences offer best opportunities for the display of advertisements and logos. The finishes make these products resistant to corrosion and rust, and can seamlessly fit the ambience of any event. Don’t leave your event patrons liable to injury by hiring ineffective crowd control solutions from other businesses in Perth. Get the fence that matches your needs and the aura of your event for better security and effective diversion of the crowd. We embark on the event assembling and disassembling, and offer a prompt fencing service that surpasses expectations. For more information on our fencing solutions, including hoarding fences and pool fencing, contact Perth Temporary Fencing today. Copyright © 2016 Perth Temporary Fencing. All rights reserved.